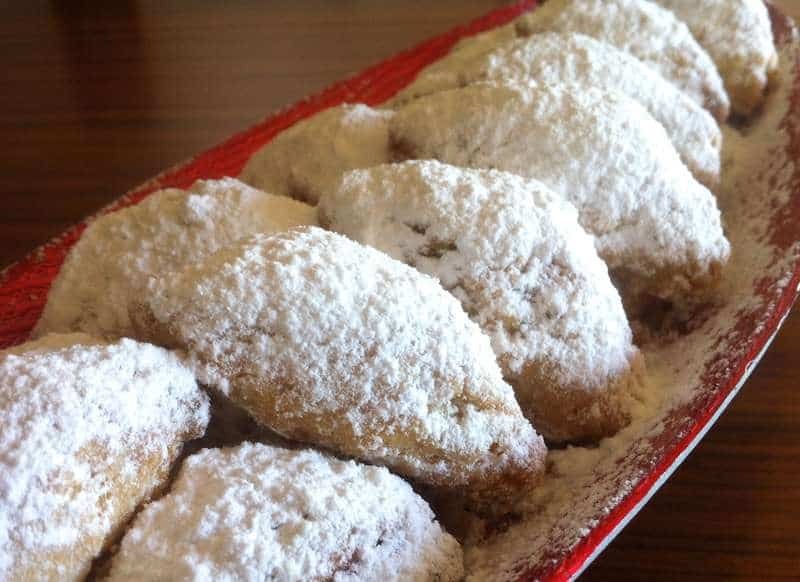 Soft and crunchy crescent-shaped pastries (skaltsounia) with a delicious, flavorful walnut, jam and apple filling. This delicious treat is perfect with a nice warm cup of tea and for the Easter Lent Season! And since they are egg and butter free, you can enjoy them with (almost) no guilt! To prepare the dough for the skaltsounia, pour into a large bowl the oil and sugar and whisk; add the wine, and the flour and blend well, using your hands, until the ingredients combine. Knead the dough, until it softens. Depending on the flour, you may need to use a little bit less or more flour than the recipe calls for. The dough should be soft, but not sticky. Leave the dough to rest for about 30 minutes. In the meantime, prepare the filling for the skaltsounia. Grate the apple into a large bowl, add the sugar, the chopped walnuts, the breadcrumbs, the jam and cinnamon. Blend well, until the ingredients combine. In Greece one can find a variety of those pastries, using different kinds of fillings, depending on the region, so feel free to experiment with the ingredients you like the most! Place the dough on a floured surface. Cut it in half and roll out each half to a thickness of about 0.4 cm. Using a 10-12 cm cutter, cut out the dough in circles. If you find it difficult to roll out the dough, take a piece of the dough (the size of a walnut) and using your hands, stretch it into a circle; repeat with the rest. Place a teaspoon of the filling on each circle and fold the dough, creating a half-moon. Join the edges well, pressing with your fingers. Preheat the oven to 180C. Place the pastries (skaltsounia) on a large baking tray lined with parchment paper and bake for 20 minutes. Remove the skaltsounia from the oven, leave to cool for a while and sprinkle with icing sugar. Enjoy! Got a comment or suggestion? Drop us a note in the comments section below. And as always, don’t forget to share with your friends and family! I don’t use alcohol in baking, because i have little kids. what is the substitute for dry white wine?? Dear Fatma, I made these and substituted a cup of orange juice. Maybe not that authentic, but really good all the same. Just got the last batch out of the oven, they are delicious! How long will they keep in an airtight container? About a week or so max.